A British construction firm has been ordered to pay almost £5m after pleading guilty to overseas corruption and breaching UN sanctions. Mabey & Johnson tried to influence officials in Jamaica and Ghana when bidding for public contracts. It also paid money to Saddam Hussein's Iraq regime, violating the terms of the UN oil-for-food programme. The Reading-based bridge builder said it "deeply regretted" such dealings and it had now "made a fresh start". The firm's new managing director Peter Lloyd said: "These costs will hurt the company and they are a real punishment. But our goal is to ensure we can protect jobs and take our business forward." 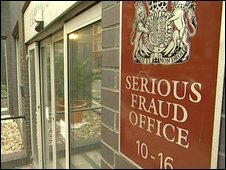 The Serious Fraud Office (SFO) said it was "the first conviction in this country of a company for overseas corruption and for breaking the UN Iraq sanctions". Mabey & Johnson secured contracts worth £60m by bribing foreign politicians and other officials with pay-outs totalling £1m. A judge at London's Southwark Crown Court on Friday fined the firm £3.5m. It was also ordered to pay a £1.1m confiscation order and £350,000 in prosecution costs. In addition the company has made £1,413,611 available as reparations to Ghana, Jamaica and Iraq. Sentencing, Judge Geoffrey Rivlin QC said the "unusual case" came to light after five of the company's directors stepped down and the new board decided to "dramatically" turn itself in to the SFO. It later handed over "deeply incriminating" documents detailing its bribery and "sanctions-busting". The firm therefore deserved "recognition and approval" for its efforts to put matters right. He said he recognised the company had taken extensive steps to distance itself from its criminal past and ensure there was no repetition. He wanted to ensure any penalties imposed would not prevent the company "continuing in business and giving employment to very many people and bringing further significant revenue into this country". Following extensive discussions with the SFO, the firm pleaded guilty to two charges of conspiracy to corrupt and one charge of breaching UN sanctions on Iraq. The judge said the company had enjoyed "extensive commercial interests" in Iraq until it invaded Kuwait in 1990. The UN retaliated against Iraq with a trade embargo, but later relented by easing restrictions with the oil-for-food programme, established to limit the humanitarian impact of the sanctions. The judge said that when the company's "kickback policy" emerged, it "seriously misled a highly reputable firm of solicitors" to cover up its behaviour. "In my view this corruption and this sanctions-busting, albeit some time ago, is the much more serious of the offences," he said. "It strikes at the heart of the government's policy not to allow the Iraqi government funds which could be used for any purposes other than those set out." The court heard that Mabey & Johnson first started paying backhanders in Jamaica in 1993. As the years passed, its "culture" of bribery spread to Ghana and other countries including Madagascar, Angola, Mozambique and Bangladesh. In a memo about Bangladesh, one of the firm's directors spoke about the need to develop "close personal relationships". It added: "The use of the 'white man's handshake' is extensive in building trust and confidence before any contract is concluded." SFO director Richard Alderman said: "The offences are serious ones but the company has played its part positively by recognising the unacceptability of those past business practices and by coming forward to report them and engage constructively with the SFO."